Last week I did a post on the popular trends in jewelry for 2017. 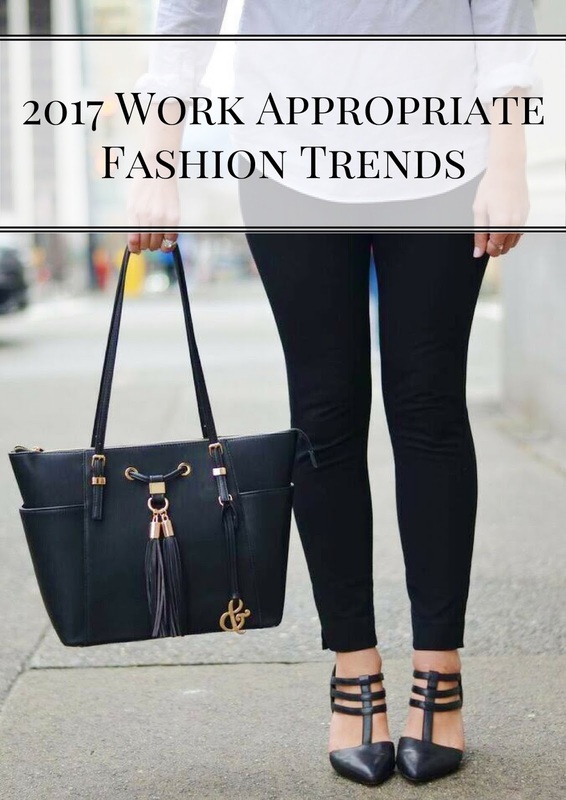 This post was so popular, that I thought I would also share a post with you on the 2017 fashion trends – but as a wear-to-work style blogger I wanted to put my spin on it, and share with you 2017 trends that are work appropriate. Move over corsets, glitter and other 2017 trends that should probably stay away from the office. These five trends are all perfect for your office day / business casual style. Stripes are a fashion staple every season. This year we are seeing a number of designers bring back the menswear inspired “bankers stripes”. The great thing about this trend is it was based in work-appropriate attire (albeit 1980’s menswear, but still). You can add bankers stripes to work day wardrobe with ease. And as bonus? There are so many chic, feminine bankers stripes shirts that can do double duty as work day wear under a blazer, and after work drinks wear without. Fashion win. This is my personal favorite professional looking trend for this year. I love the classic look of a white dress and the combination of masculine/feminine with the dress shirt style on a dress, is right up my alley. This is a great trend to wear to work this summer. I told you stripes were loved in the world of fashion! In addition to the understated bankers stripe, bold stripes will also be trending this year. Bold meaning bright colors, or different sized stripes mixed together. To be honest with you, this is the trend I am most wary about. Probably because it gives me traumatic flashbacks to the horrible khaki pants I wore circa 1998 *shudders*. However, the khaki textile was huge in designer’s spring collections – from Stella McCartney to Balenciaga. I’m willing to give it a try – especially as a work skirt. Bows adorning everything from tops, to handbags to shoes, will be huge this year. Especially as we enter spring and summer of this year. Get a head start on your spring/summer work wardrobe and pick up some of these gorgeous bow items. What do you think about this year’s trends? Which is your favorite trend for work day style? I had no idea those were called banker's stripes. It makes me love them even more now that I know they have a cute name! But I think I'm most excited about white shirt dresses for spring, as long as I can keep from spilling on it! Haha right?! It really is an awesome name. And yes! Me too! I am obsessed with white dresses in the spring/summer, so being able to translate that into work appropriate white shirt dresses is something I am SO looking forward to.